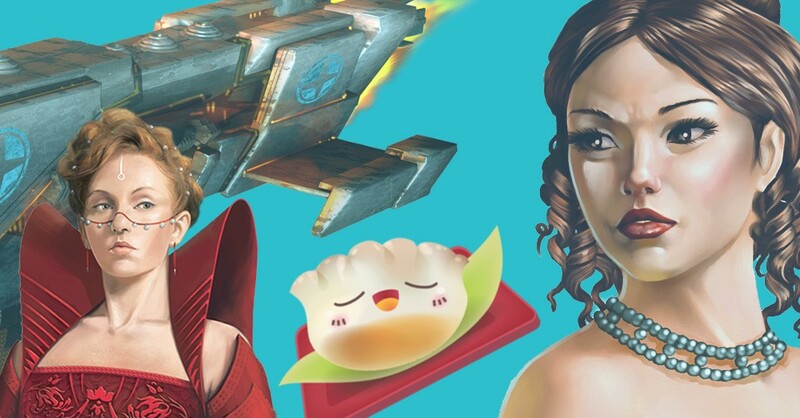 Quinns: In an age where we can fit dice on rings and hold Battlestar Galactica LARPs in decommissioned warships, team SU&SD has learned that rules can only hold us back. The only rule we have left is that before we review a game, it has to be available for our readers to buy it. Today, we’re breaking that rule! 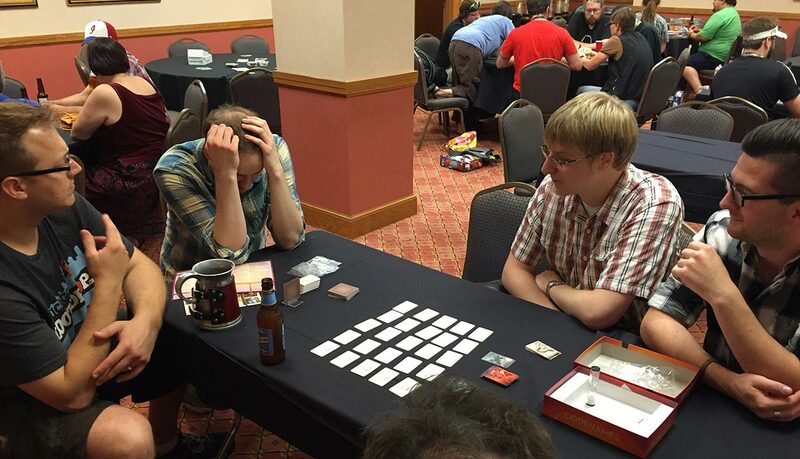 Codenames was the smash hit of Gen Con this year. It’s still perched happily atop BoardGameGeek’s “Hotness” sidebar, it sold out despite having a terrible name and a terrible box, and it’s the game I heard most people gossiping about. Under such crushing hype, and knowing that articles will soon be flowing in, today we’re offering our review early. Let’s start with two words: Vlaada Chvatil. Then another five: He’s done it again. Yes! 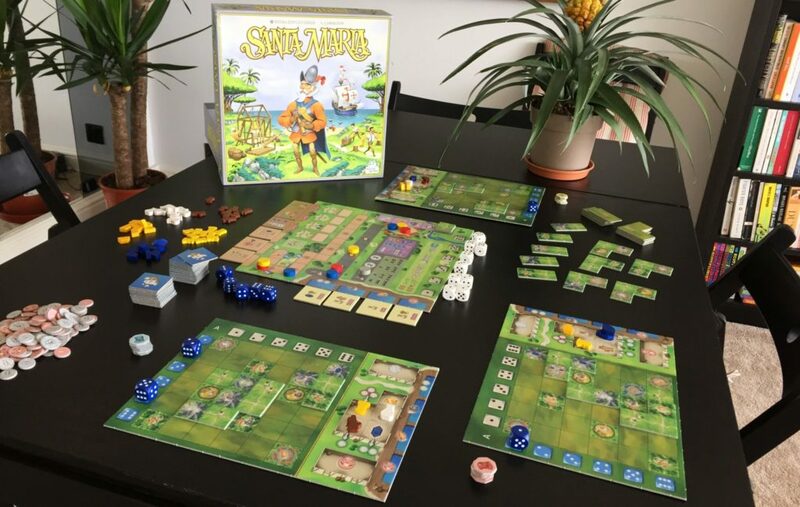 The brilliant, hilarious Czech designer behind such fantastic games as Through the Ages, Bunny Bunny Moose Moose, Galaxy Trucker, Space Alert, Mage Knight and Tash-Kalar (a list that’s frankly implausible in its quality and breadth) has a new design out. 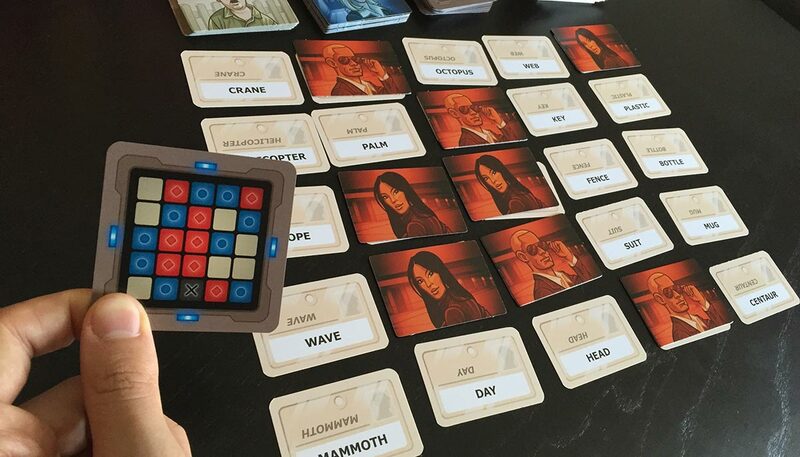 Codenames is a team-based party game for 4 to 8 players. I’ve played it with 15 different people, and all 15 of them have come away wanting to buy it. Including me. 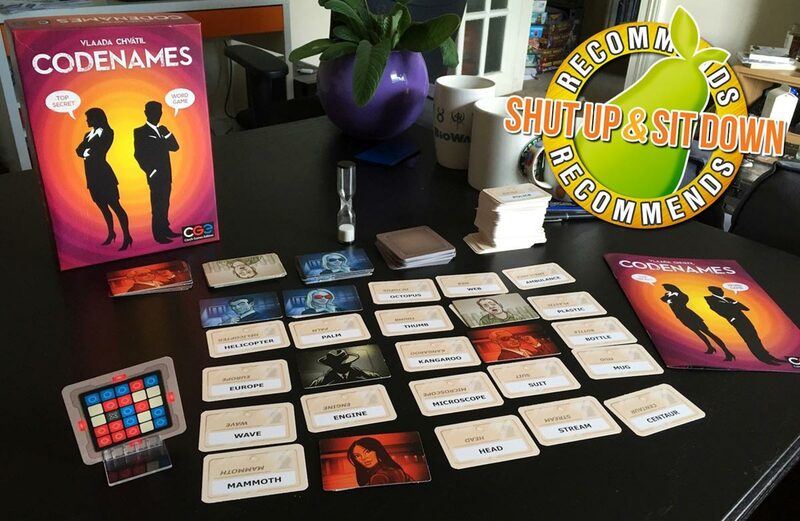 In other words, Shut Up & Sit Down Recommends Codenames. Here’s how it works. You deal out a grid of 25 words, divide your players into two teams, and each team nominates a team leader. How you go about this is equally simple. Each turn, the team leader says a single word (that can’t be on the board) followed by a number, for example, “Desert 2”. What you’re saying there is that two of your team’s words on this grid relate to deserts. The other players on your team then play a kind of verbal minesweeper, discussing the clue in a way that will invariably see the team leader wanting to bang their head on the table. “Palm trees are in the desert! Aren’t they? Oh! You need bottles in a desert! Or, um…” Eventually, they’ll point to a word and wince. The team leader then covers this up with the word’s corresponding tile, hopefully an agent of your colour. 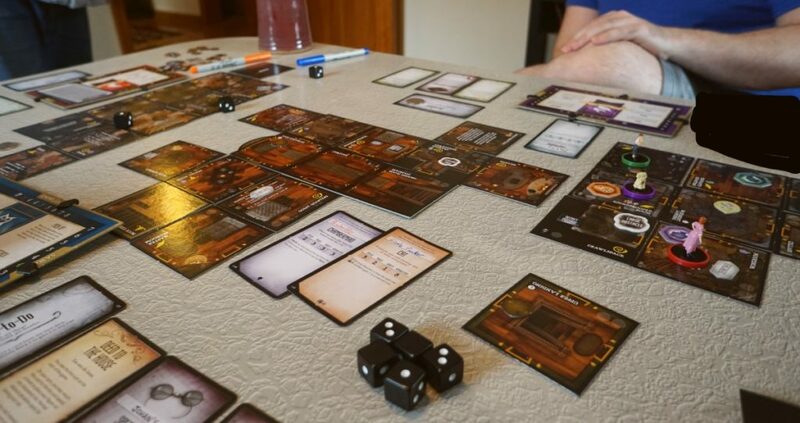 What you don’t want is for it to be an innocent bystander, because then you have to stop guessing and pass your turn over to the other team (not forgetting the clue you failed to get which is, of course, still on the board). What you REALLY don’t want is for it to be an enemy agent, as you give them a point and still have to stop guessing. But what you really, really, really don’t want is for it to be the assassin word, because then you instantly lose the game. Another wonderful touch is that there’s a sand timer included the box, which players are meant to flip whenever they think someone is taking too long, including themselves. Joy! That’s the entire game, so you guys probably need an explanation of exactly why Codenames stormed Gen Con. Please! Allow me. 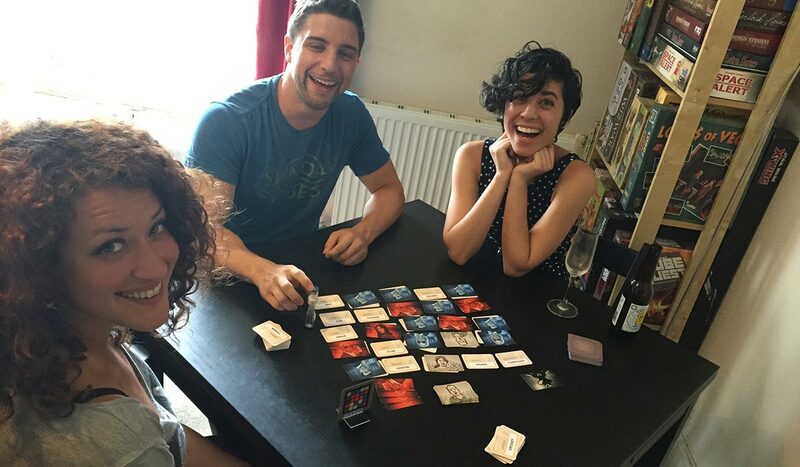 Above you can see Lukas Litzinger, lead designer of Android: Netrunner, completely losing his mind as team leader. That’s because the problems he’s facing are all so clear, but any solutions are totally absent. You need to search for clues to tell your friends, but then you need to cross-reference those clues with other words on the board to make sure you don’t point them in the wrong direction. Then you’ll find yourself checking where Assassin is for the fourteenth time to make absolutely sure they don’t hit it. Or you’ll remember it a second after uttering your clue and immediately facepalm because you forgot about the assassin word. At which point you’re left watching your idiot lab rat friends nose around, praying they don’t get you killed. But it’s worth the effort, because success feels fantastic. Few games offer such an incredible, immediate sense of achievement as Codenames, when you produce a fantastic clue that your friends then GET and the entire opposing team moans aloud as you drop one, two, THREE blue agents on the board. POW! But this doesn’t mean the other team is out of the running. It just means their team leader has to put together an even more elaborate clue. “Heist 4”, they might say, “Hollywood 5”, or “Women Unlimited”. Yes. Team leaders can also append “Unlimited” to a word to grant their team the power to guess until they get too scared to proceed (or reveal an enemy agent). That’s a powerful ability, but of course, then your team has no idea how many agents relate to the word you just said. 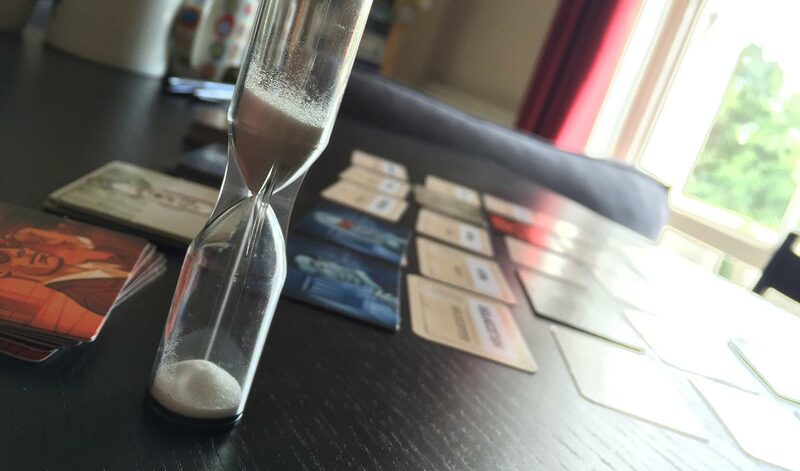 Whoever wins or loses, though, Codenames enjoys the same outburst of talking after it finishes that Mysterium does. Although here, the game takes 30 seconds to set up and 15 minutes to play, so it’s the work of an instant to break it all down, set it up again and swap the leaders around and play again. Am I missing anything? Oh, yes- Codenames is funny. The team leader has all the power but can’t speak, so any time a team makes a mistake there’s incredible frustration and one-sided infighting which is going to collapse the other team into hysterics. And mistakes happen a lot in Codenames, partially because you inevitably fail to spot a word or two, but also because brains don’t always work in the same way. Team members can argue about what a clue means, which is funny, or they can be unanimous and confident and still be wrong because they weren’t on the same page as their leader, which is just as funny. But as I’ve said, Codenames is just as good when you absolutely ace the puzzle, when an entire team works in harmony and never puts a foot wrong. And each round will have a little bit of this, just because failed clues don’t go anywhere- if you fail at my “Desert 2”, you still know two of the words relate to deserts, and that often leads to photo finishes as failing teams catch up at the last second. So let’s recap. Codenames is a deep game with simple rules, it’s tense and silly at the same time, and it’s fun when you’re winning and even better when you’re losing. Maybe now you see what the fuss is about, eh? 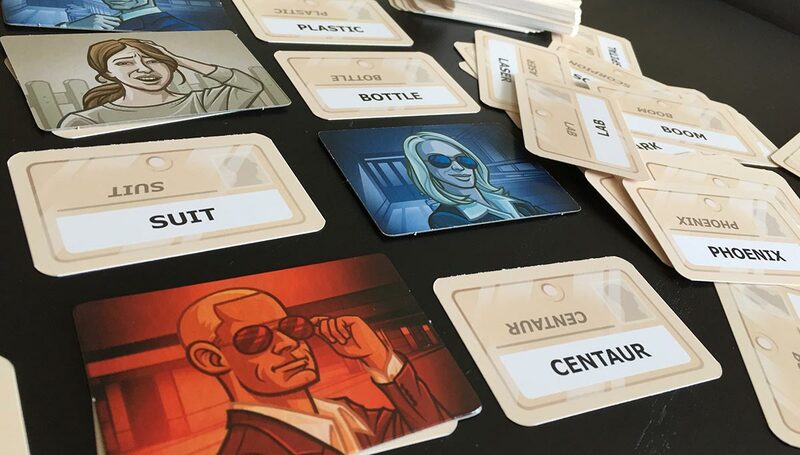 Codenames is scheduled for a general release in October.